As town officials await word on a $1 million grant request to upgrade the North Granville Water District, the system’s aging infrastructure is once again causing problems for residents, who were ordered on Monday to boil their water. Earlier this week some homes in the district were fed dark brown murky water, while the water was cut off to others. A service line burst on Route 12A just off Route 22 in Truthville Sunday night, causing water to spew up from the ground. Notified by a homeowner, highway supervisor Eric Towne sent crews to the scene and they worked into the night Sunday and from about 7 a.m. to 1 p.m. on Monday to resolve the issue. It is still unclear what caused the break. Officials said the leak probably started a few days before residents saw the water spewing up from the ground. discovered a broken shutoff valve that had been worn by the ground clay. 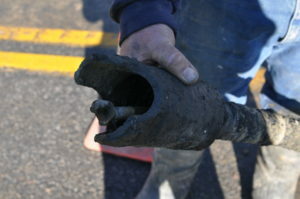 Pictured: Highway Department worker Marc Kretzer holds the broken valve. Town Supervisor Matt Hicks said that the system could have been strained when local fire crews used a hydrant in the district to refill one of its tanker trucks while fighting a fire Sunday evening. When a large amount of water is drawn from the system at a rapid rate, the sediment and other particles that are built up in the pipes give way, causing residents to see discolored water. “We had a dirty water issue over there because the firemen pulled water out of a hydrant there,” Towne said. He said the fire companies do not usually fill their tankers in the district. “Not unless it’s an emergency,” he said. In this case, it was. A call went out at 5:17 p.m. for a structure fire at a garage on Route 22, near the intersection of Route 40. Around 9:30 p.m., Towne received the call regarding the water leak. The fire company used the water at the station last week, and, McCullen said, the water was just as bad. The hydrant used to fill the tanker was about half of a mile from the burst pipe. Usually, the fire company uses a dry hydrant on Aiken Road, which is outside the North Granville water district, to fill its tanker trucks. In the past, McCullen said, he would not hook onto a hydrant in the North Granville water district because it cannot put out enough water to fight a structure fire, but the water levels in the district have been better. “We are in good shape water-wise,” Hicks said. Water levels in the North Granville water district have been between 23 and 24 feet when the pump is shut off. Washington County issued a boil water notice Monday for all 240 North Granville Water users, “due to a significant leak in the North Granville Water District system.” The notice was posted on the Washington County Department of Public Safety’s Facebook page and was delivered to area residents with land line phones and other registered devices. The work on Route 12 A took crews a bit longer to fix because the shutoff valve in that area was not functional. The steel valve, which was installed as part of the district’s original system back in the 1940s, had been weathered by the clay in the ground. Before crews could address the leak, they had to fix the shutoff infrastructure. “Age was against it, and the clay…it works against the steel and eats it,” he said, noting that there are many more steel shutoffs that need to be replaced in the system. During this process, crews shut off water to more than 100 of the 240 North Granville water users for about 20 minutes on Monday. Households on Cary and Hicks roads and Brookside Lane were affected. Crews replaced the shutoff valve and put in a new pipe where the old one was broken. Danielle Shaw, who lives a few houses down from the hydrant, noticed Sunday night that her water was a dark brown color. Around 5 p.m., she turned on the bathroom sink to find the murky fluid. Shaw said she’s experienced dirty water before, like when The Orchard Nursing and Rehabilitation Center in North Granville tests its sprinkler systems. “… but it was never that bad,” Shaw said. Shaw and her family drink water from the tap at her home on Route 22. She said her main concern is the town’s lack of communication to the residents when there is a problem. “How long had it been going on?” she said, adding that by Monday afternoon, she had still not received notification or a call from the town about the murky water. “Our infrastructure is failing … I’d like to know what they are going to do about it,” Shaw said. The town this summer applied for a grant specifically for the North Granville water district. The $1 million Community Development Block Grant will enable it to address several issues: water supply, pipes, and equipment to maintain the system. Hicks said the town should be notified in about two weeks whether it will be awarded the grant. “It would cost a lot of money to rebuild the infrastructure as it should be,” he added. Hicks said the replacement would cost about $3 million.